A practical handbook and guide to global cinema exhibition industry, TheatreWorld showcases the industry in its entirety with a charming mix of newest trends andold world tenets. It not only captures the industry’s pulse on hot topics but also presents the same in a very pulsating fashion through a balanced, fine blend of columns, features, special stories, technology series and photo essays. The publication consciously stays away from the glossy stardom and gossipy grapevine of the ‘showbiz’, and focuses wholly on the technology and systems that make the entertainment show its worth. In essence, the publication has two distinct sections – TheatreWorld and TheatreMagic for global and India-specific audiences respectively. 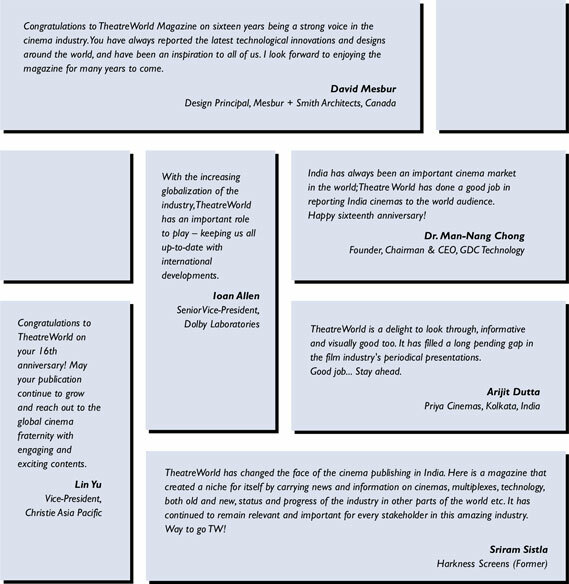 TheatreWorld, a magazine for the theatre Owners, Cinema Equipment Manufacturers, Technology providers, has been making waves in the world community for the last 18 years and still stands strong in updating the Cinema nd Entertainment Industry about the new technological evolvement and market trends. The magazine has witnessed the transformation from Film-reel Cinema to Digital Cinema. It is strongly focused on Multiplexes and Single Screen cinema theatre market with international reach. The only magazine of its kind, TheatreWorld is renowned world over with a unique brand equity, which is a collector’s guide a reference guide to readers. Be a part of the magazine that helps your brand and product establish itself in the world Cinema Market. 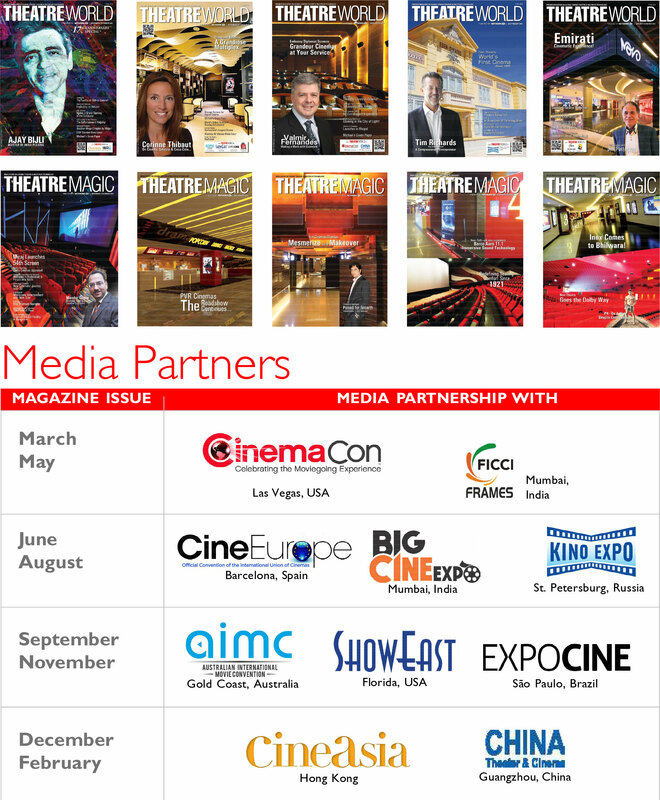 Be a part of the magazine to become apart of the Global Cinema Industry. 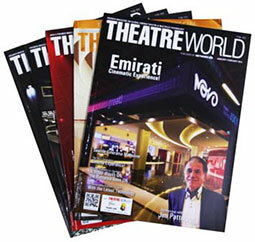 TheatreWorld is the only highly circulated cinema exhibition magazine across the world. TheatreWorld is the only magazine circulated across nations; other magazines in the same league are circulated in limited regions. Apart from the above, TheatreWorld is also showcased at various industry seminars, meetings, product launches, film festivals, forum meets, etc. The above schedule might change due to some unavoidable circumstances. Magazines might not be displayed at some shows due to some unavoidable circumstances.